Here are photos of the other side of the Ravelry Attitude Adjustment Mug. In the tea ball is one of my new favorite teas. It is a Lupicia black tea called Yuma. The description on the package says, “A taste of happiness with vanilla, fruits and pretty rose buds.” I tasted a sample and bought a bag not really reading the description. I was pleasantly surprised by the tiny rose buds. They are listed as Rugosa rose bud in the ingredients section on the package. The tea has a nice sweet aroma too. 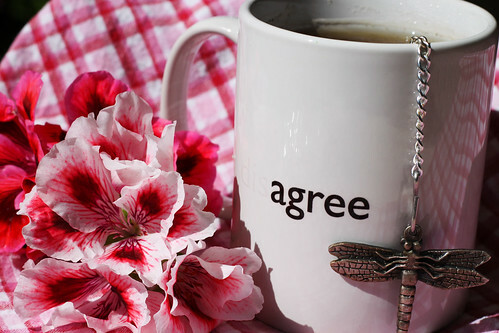 It would be really hard to be disagreeable when sipping this tea, so I thought it would be good one to photograph with the mug. 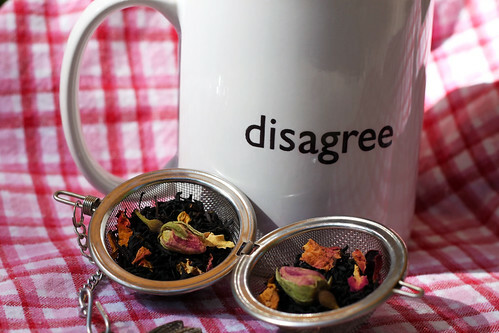 I love that the saying changes from ‘disagree’ to ‘agree’ with the addition of a hot beverage. I didn’t spend any time this morning on the photography part of this post, I needed my caffeine fix. It was cool to notice that some of the geranium blossoms matched the tea towel. I snapped them off and placed them next to the mug making the second photo more agreeable too. This entry was posted on Sunday, May 24th, 2009 at 3:00 am and is filed under Tea. Tagged: Photo, Tea. You can feed this entry. You can leave a response, or trackback from your own site. I *love* that the wording on the mug changes. Awesome!